The International Maritime Museum Hamburg opened its doors in the summer of 2008. It took up residence in Kaispeicher B, a warehouse dating from 1879 (architects: Wilhelm Emil Meerwein, Bernhard Hanssen); it is actually the oldest warehouse in HafenCity and the Speicherstadt. From the summer of 2005, architect Mirjana Markovic had extensively renovated the warehouse at Elbtorquartier, converting it into a museum but leaving its characteristic architecture intact. The ten floors or “decks” of the museum, covering 11,500 sqm, house an exhibition based on the Peter Tamm private maritime collection. Kaispeicher B and its adjacent building also accommodate the Institute of Shipping and Marine History and a library, including an archive. Hamburg has an incomparable landmark in the shape of the Elbphilharmonie Concert Hall. Swiss star architects Herzog & de Meuron are now erecting a spectacular concert venue within the walls of mighty Kaispeicher A, a cocoa warehouse built between 1963 and 1966 to plans by architect Werner Kallmorgen. Its cubic shape and brick façades remain intact. Thus by 2015, a worldwide unique architectonic hybrid will have emerged, also housing a five-star hotel, some 45 apartments and a parking garage. The former warehouse building is crowned by an undulating, curved and inclining glass structure, up to 110m high, blending elements of historic port architecture and contemporary architectural creativity, port tradition and the district’s new identity. 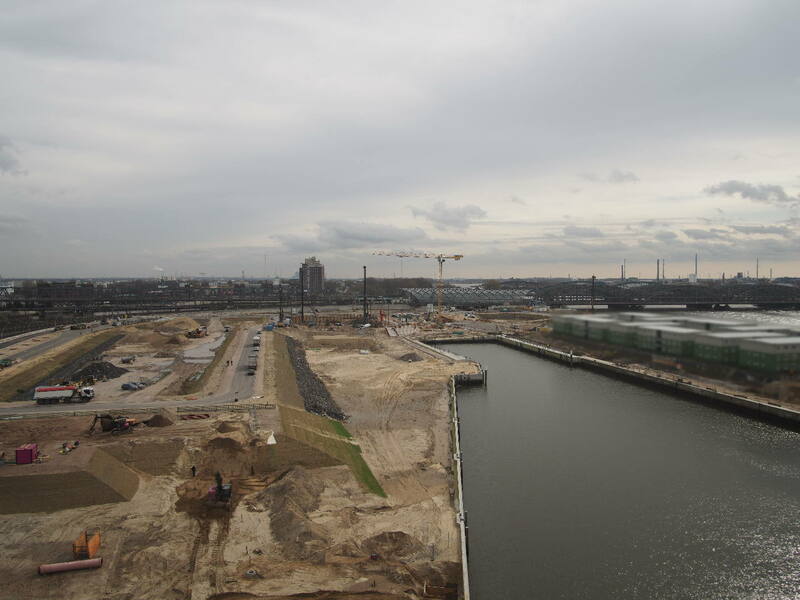 A public plaza offering fantastic views of the harbor, HafenCity, the River Elbe and the city will take shape at a height of 37m on the original brick building below the new glass structure. Two thirds of the warehouse shell will be used for car parking, but backstage areas and places for musical education will be accommodated here as well. The new glass superstructurewill contain two auditoria holding audiences of 2,150 and 550 respectively. The unveiling of the first designs by architects Herzog & de Meuron in 2003 caused an international sensation; yet their plans could only be realized through the unequalled commitment of Hamburg citizens, more than 7,500 of whom promised support and endowments for the construction of the concert hall. However, the city’s contribution will be considerable due to the rising cost of the building. Another outstanding cultural project will be housed in a building created by Rem Koolhaas and his Office for Metropolitan Architecture (OMA). In early 2008, the Dutch architect presented his reworked designs for the Science Center. The structure, now conceived like a standing, angular ring, will be located right next to the River Elbe in Überseequartier. Emblematically the Science Center opens out toward the port as well as the city, symbolizing a gate into the world of knowledge. The exhibition concept resembles a global scientific experiment kit: the ten key topics will be given an exciting treatment that will make them understandable to children, teens and adults alike. The exhibition concept was developed in 2006 by project development company Groß + Partner in close cooperation with representatives from universities, experts from Hamburg and elsewhere, scientific journalists, officials of the Free and Hanseatic City of Hamburg, and HafenCity Hamburg GmbH. It includes many hands-on exhibits which are designed to be touched and tried out: here, playful exploration and independent experiments turn learning into an exciting experience. Whether the Science Center can actually be built is still an open question, however. Since the public share of funding (once planned to be EUR 46 million) is no longer available, and operation of the center by the state no longer appears feasible, the Science Center is wholly dependent on the generosity of sponsors. HafenCity Hamburg GmbH is not responsible for content of external Internet pages and does not vouch for it.